Yay! So excited that my Modern Block of the Month quilt is all done! Of course, it did not go off without a hitch or two. I decided to just quilt the sashing with an all-over meandering stitch, which was fun to do. Sometimes I got bored and added little hearts or flowers into an otherwise random design. I again used the sulky thread, this time in silver (1327 dark whisper grey), which blended beautifully with the Kona Silver I was using. My first problem was a relatively minor one: the beautiful Tula Pink Freefall backing snags pretty easily on the feed dogs of my machine. Perhaps it is because it has more of a sateen feel to it? After dropping the feed dogs it didn’t become an issue again until I needed to sew the binding. For the binding, I chose a medium grey dotted fabric that had some of the lighter silver mixed in. I had about half a yard left and it proved to be just enough. Once again, I machine stitched the binding on both sides. Not as pretty as hand-stitched, but I have so little patience when I am at the end of a quilt. My two bigger hitches were two popped seams I found in the middle of the quilt when I was picking off threads. Not sure how this happens when I am using larger than 1/4 inch seams! Both were sewn up with a zig zag stitch, which unfortunately is somewhat noticeable. I don’t really see any other way to fix these at the end after the quilting has already been done. The only other option seems to be fabric glue, and I’m just always concerned that it won’t hold up. If anyone has ideas for the next time (and there will be a next time!) please send them my way! Finally finished, wrapped in tissue paper, and packed up in a box for one of my best friends who has no idea it is coming! Can’t wait to mail it! 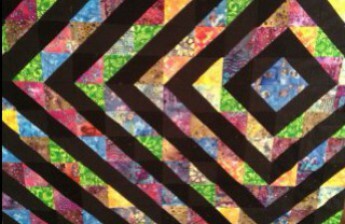 ← BOM Quilt Top Finish!